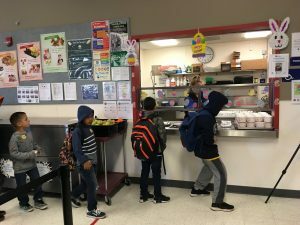 Students, parents, teachers, and staff at Maryland Elementary School kicked off National School Breakfast Week 2018 this morning. Running from March 5 through March 9, National School Breakfast Week encourages everyone to “get social over school breakfast”. The goal is to increase student participation in school breakfast by making it fun. Schools also spread the message to parents that school breakfast is healthy and delicious. 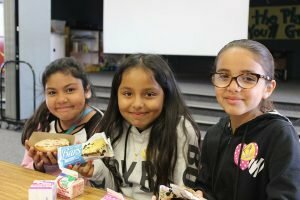 The celebration even reaches teachers and staff, encouraging them to model healthy breakfast behavior and connect with their students. Students show the variety of breakfast items available during National School Breakfast Week (and every week!). This year’s National School Breakfast Week theme is “I heart school breakfast”. 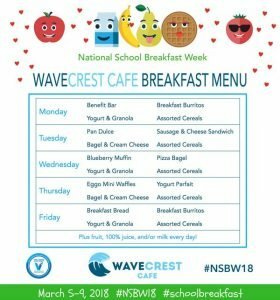 Promotions included the use of emojis and hashtags (follow #NSBW18) to connect with kids on their level and get them more excited about school breakfast. Emojis took on a breakfast-y theme: the heart eyes emoji turned into an orange, a banana makes a kissy face, and a new milk box emoji makes an appearance. 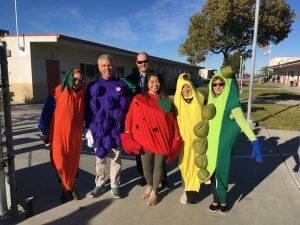 Jamie Phillips, Director of Nutrition Services, poses with teachers in fruit and vegetable costumes. Teachers and staff at Maryland Elementary took it one step further by donning fruit and vegetable costumes! 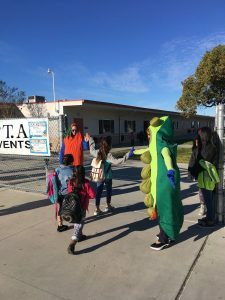 The larger than life grape, tomato, banana, sweet pea, and carrot greeted students and their parents, posed for selfies, and gave out lots of high fives. A students gets a double high five from Maryland Elementary teachers in costume. WaveCrest Cafe adopted a more personal breakfast theme: “breakfast is the best!” Student photos along with their favorite school breakfast item were displayed around Maryland Elementary, while a playlist of upbeat songs filled the cafeteria with dance vibes as parents and students filed inside. 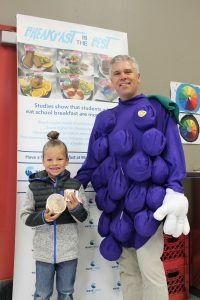 Maryland Elementary Assistant Principal Erik Korporaal in a grape costume takes photos with students to promote “breakfast is the best”! 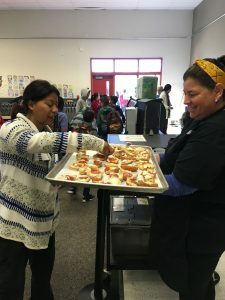 At Maryland Elementary’s WaveCrest Cafe, students lined up to make their selections while parents got to sample the new breakfast pizza bagel. Topped with protein-rich mozzarella cheese and pepperoni slices, the breakfast pizza bagel is a big hit with students. 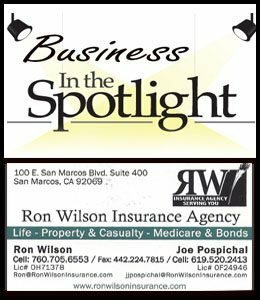 Also available were Benefit Bars, breakfast burritos, a variety of whole-grain cereal, and fruit and milk. 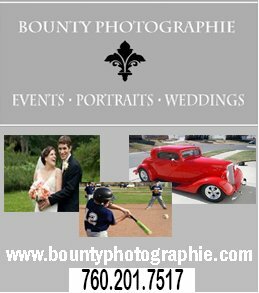 Whole families attended the opening celebration and enjoyed school breakfast with their kids. WaveCrest Cafe kitchen manager shares samples of the new breakfast pizza bagel with parents. Also attending the celebration at Maryland Elementary were representatives from Vista Unified School District and the school board. Jamie Phillips, Director of Nutrition Services, posed with the costumed staff, greeted parents, and chatted with students about their breakfast. 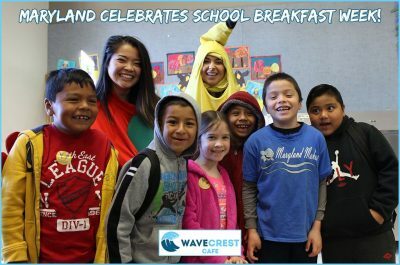 VUSD school board trustee Cipriano Vargas promoted the WaveCrest Cafe theme of “breakfast is the best!” by taking photos with students. 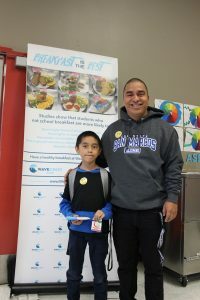 VUSD school board trustee Cipriano Vargas promotes school breakfast by taking photos with students. 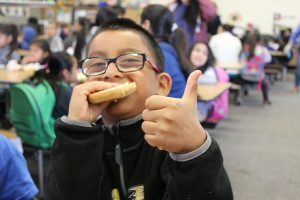 Maryland Elementary Students give the new breakfast pizza bagel a thumbs up! Eating breakfast at school also reduces stress on parents in the morning, who can instead rest assured that their child is eating a healthy morning meal. 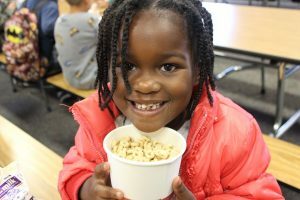 Students are all smiles about the heart-healthy cereal choices at Maryland Elementary! New and exciting breakfast menu items will be available in WaveCrest Cafe across all Vista schools this week. 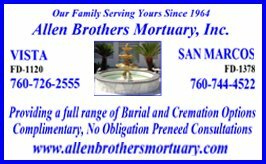 Options include mini Eggo waffles, yogurt and granola parfaits, a pepperoni pizza bagel, and pan dulce. As always, fresh fruit, milk, and 100% juice are available! Students select from a new breakfast menu during National School Breakfast Week at Maryland Elementary. Keep an eye out on your local news for more coverage of National School Breakfast Week! You can also follow WaveCrest Cafe on Facebook and Twitter to get the scoop on breakfast (and lunch) offerings. Make sure to get to school a little early all week for school breakfast and socializing with friends before class!